INVESTIGATIVE JOURNALIST Amitt Bhatt is facing deportation to India and the likelihood of arrest and torture - possibly even death - for his work exposing corruption and human rights abuses in war-torn Kashmir. On 14 March his last-chance appeal against deportation will be heard - and the National Union of Journalists is calling a public meeting to support his case. The meeting is in London on Monday 6 March and London Freelance Branch voted on 13 February to support it. It will be at 18:30 at the NUJ HQ, Headland House, on the corner of Gray's Inn Road and Acton Street, London WC1. 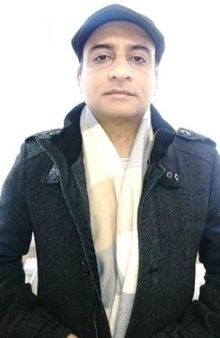 Amitt Bhatt - a member of the NUJ Manchester branch - fled India after his investigations into government corruption put him under threat. He is a Kashmiri Pandit and has written three books about human rights abuses and corruption in the state. In 2011 he was arrested and tortured and beaten but managed to escape and spent three years on the run. In April 2014 he was able to leave India and claim asylum in the UK. His claim was turned down and he lodged the appeal to be heard in Manchester on 14 March. Amitt's activities would make him particularly vulnerable given the current situation in India. There have been numerous incidents against journalists including threats and intimidation, harassment, kidnapping, murder, torture, extra-judicial killings, false criminal and sedition cases, and unlawful censorship. He worked for the newspaper Publicmail , which exposed corruption and human rights. His high-profile investigations covered the Commonwealth Games timing, scoring and results scam which saw the Chairman of the 2010 games Organising Committee, Suresh Kalmadi, and other senior officials, jailed. He had taken a job in the technology department of the Commonwealth Games and was reporting from the HQ in New Delhi until his cover was blown. He reported cases of malpractice and corruption in government ministries, engineered riots, the exploitation and trafficking of women and malpractices in India's political system. In February 2011 he was detained by the authorities in a kidnapping independently confirmed by the International Federation of Journalists (IFJ), which supports his case. He was tortured for more than a month, including by sustained flagellation, electric shocks to the head, sleep deprivation, foot whipping and being forced to drink petrol. He was interrogated on the location of documents, his associations and other information which he had gathered in support of his journalistic activities. After a month he managed to escape through a toilet window, made contact with friends and supporters who provided medical attention and kept him secure, moving him from one safe house to another. But his physical and mental health were severely affected and he still suffers from ulcerative colitis, epilepsy seizures, deafness and tinnitus, migraine and depression. He says: "I almost had turned into a Zombie, a walking talking dead man." Finally he was able to establish contact with a friend who was in touch with Amitt's wife who had fled to the UK, and with the help of friends a visa and flight to Britain. Amitt is a member of the NUJ Manchester and Salford branch and other union branches can contact nujmanchester@nuj.org.uk for information. Last year his case featured on ITV's Granada reports . It is here: view it and forward to friends and supporters.